Over half of the 2000 homeowners recently surveyed by Confused.com hide their valuables in their sock drawer, on top of the wardrobe, under the bed and under the sink – all obvious places that would not fool any burglar. They also found that people are generally keeping more cash at home than before because of poor interest rates and mistrust of banks; on average around £1100. Unfortunately, many home insurance policies only cover small amounts of cash in the home – often just £500 or even £250. It would seem therefore that we are not really taking home security too seriously. Unless we have been victims of crime already. The survey indicated that many of those who had experienced a break in had taken measures to protect their home – almost half had had a burglar alarm fitted, 30% had upgraded their door and window locks and 15% had even resorted to getting a dog. That backs up what we find; unfortunately it often takes an incident to make people take action. An alarm is a good deterrent to burglars; 9 out of 10 will change their mind about breaking into a home that has an alarm installed. Anti-snap cylinder locks will also make their task much more difficult but if someone does manage to gain entry – and it can be as simple as someone sneaking in an unlocked door while you are in the garden – it would be prudent to protect your valuables by keeping them in a safe – so much better than a sock drawer! It also allows you to lock away sentimental items that perhaps are not worth very much in monetary terms but are irreplaceable. Most opportunist burglars are in and out of your house very quickly – they do not want to get caught in the act. 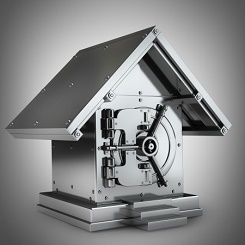 Safes come in a range of sizes with different locking mechanisms and even the most basic would make it very difficult for a thief to penetrate it, and certainly not within the time frame that they have. For further information on the range of safes that we offer just give us a call on 01924 371941 or come down and see them in our security shop in Wakefield. We also offer safe repairs so if you have a safe that is broken or you’ve lost the key or forgotten the combination, we may be able to get it functional again. previous Is Social Exposure risking your Security? next Yorkshire: The Place-to-Be for Burglars?